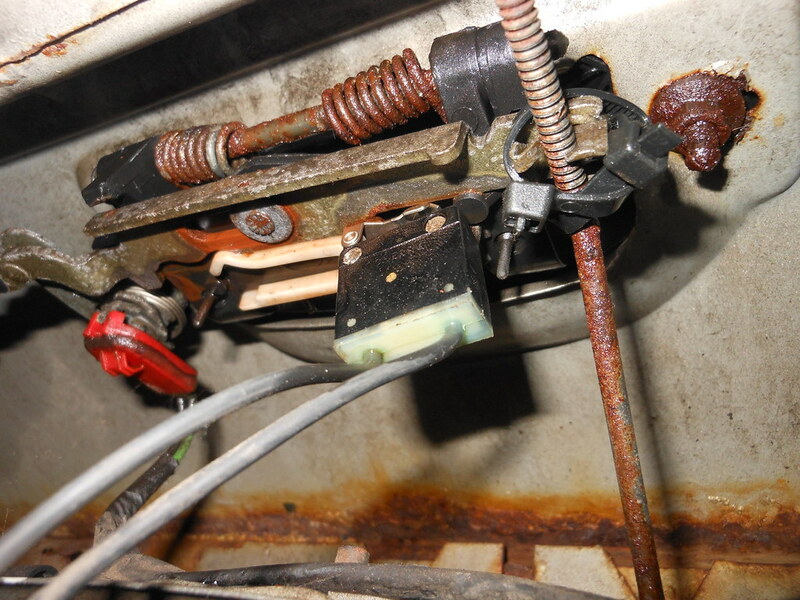 JeepForum.com > Models > Jeep Grand Cherokee & Commander Forums > ZJ Grand Cherokee Forum > 96 ZJ Trunk stuck shut! Future Mods: lift, tires, etc. Guys, my trunk is stuck closed and for the life of me, I cannot get this thing open! I have read and read how to get this thing open but I just can't get it! anyone ever had this happen? Try to push down/ forward really hard on the tailgate while trying to open the latch. There is an adjustable arm inside the door the attached to the handle, It comes loose over time. To fix it, you need to get the panel off and readjust it. The rod pointing up on the right has zip ties on it to keep the worn out keeper from slipping in the lever that releases the hatch latch. Do not try remove the rear door car. From inside the vehicle, peel off the carpet of the rear door card. Then use a hole saw to drill out near the door latch a 1.5 inch hole. Then use some welding wire to hook open the latch mechanism. You can use contact spray to re-attach the carpet seemlessly. 93 ZJ 5.2, 3.58 stroked. 242 swap. 2.5" lift. dozens of mods. Some people claim you can hit it beside the latch. I only dented mine a bit and got a sore hand. The "drive down a bumpy road" method worked for me. You can't remove the panel with the hatch closed, IIRC. At least not very easily and without causing damage (which you may not care about). On mine, the arm hadn't come loose, it was simply a build-up of dirt/dust in the factory-applied grease had turned it into a sticky wax-like substance. Cleaned it off and it worked fine dry. Did put new grease on it though. And I think I did wire it too, just in case, instead of zip ties. Recovery: I have the tow truck number on my cell phone. Mine sticks from time to time. I pull out on the handle and pop it on the left side of the handle with my hand and it submits. You need to learn the secret ZJ handshake. You want to push in on the door with your right hand, just to the right of the latch. Just as you reach max pressure with your right hand, lift the latch with your left hand, then release your right hand and the door will pop open. Fix the deal in Goldwing's pic above while you still can. It becomes much more difficult to fix if you can't get the door open like this. GOLDWING and 1shotleft like this. I literally did this job yesterday. No need to cut, drill, or destroy anything, rig up wire handles, or hit/bump it in the right spot. Open the window. Remove the overhead light and rear pillars trim pieces (not necessary but makes the job incredibly easier if you can), then as many screws as you can find from the liftgate panel. There's 12 screws you'll need to remove from the panel, 2 in each vertical arm, 1 just below each arm on the outside, 4 under the window, and the 2 in the bottom corners of the carpet area (look for holes), all accessible with a regular screwdriver. You can't get the liftgate panel completely off because of the 2 screws currently captured between the bottom of the gate and the striker plate trim panel, but removing all the rest of them will allow you to wedge the top open enough to where you can slip your hand down, peel back the rubber sheet covering the opening, and pull up on the threaded rod linkage. That'll pop the gate latch open. Once opened, remove the last 2 screws from the bottom of the liftgate panel and take it off. Take a pair of needle nose pliers and remove the threaded rod from the claw bracket, and bend the two retaining tabs (on the left side of the claw) back out a bit. They've gotten deformed over time from all the pushing and pulling when you lock and unlock your jeep, which allows the rod to slip up a few threads and doesn't allow the linkage to pull up enough on the latch. Brush away any rust with a wire brush, lube the heck out of everything, then cycle the linkage manually until you think it's smooth enough, then lube it and cycle it again a few more times just for good measure. With the linkage in the unlocked position (like it is in Goldwing's pic above) pull up slightly on the threaded rod then clip it back into the claw bracket. There should be very little vertical play in the linkage. This will give you plenty of pull length and still allow enough clearance to latch properly. If you're going to use zip ties to secure it further, make sure they only go around the threaded rod and the RIGHT SIDE of the claw bracket, not around the retaining/pressure tabs on the left, similar to the lower tie (the one that was installed first) on Goldwing's pic, so the tie doesn't pull the rod away from the claws. Tighten up the nut that secures the handle. Hit your door locks a few dozen times to make sure everything works properly and doesn't bind, adjust as necessary. Last edited by DjZJ; Today at 09:09 AM. Reason: Forgot about 2 screw locations. Barricade Garage just did a video on you tube about this. Search for it, this stupid forum won't let me post YT links . The fix in that video requires breaking off the screws embedded in the plastic of the license plate panel. If you pause the video at 1:20, you'll notice divots on the back side of the panel, to the left and right sides of the license plate screw holes. Those line up with what look like standoffs attached to the lift gate in the next scene @ 1:22. Those "standoffs" are the screws that used to be attached to the panel. When he removes the panel, you can see what looks like RTV or similar gasket/adhesive material hanging off the side, which would now be the only thing holding it on. I know he says his arms are too big to gets them down between the lift gate panel and the lift gate itself, but I'm a 6'5, 300+lb ex defensive lineman and I did it, so unless he's literally just a giant forearm, it's doable. These jeeps rattle themselves apart over time enough as it is, no sense in speeding up the process by unnecessarily breaking things.